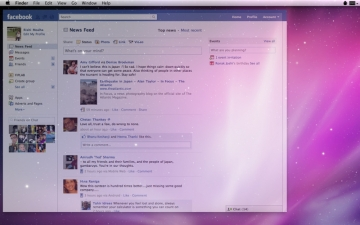 [値下げ] Ghost for Facebook | Mac App Storeのアプリ検索・ランキング BuzzMac! Ghost for Facebook discreetly sits on top of your desktop wallpaper, providing you with instant access to your Facebook account without the need of using your web browser. Hover your mouse over the app's window when it is active and the semi-translucent Facebook page will become fully visible, bringing the Ghost to life! Ghost for Facebook will automatically refresh your Facebook page at any interval you choose via the Preferences panel, and you can even tweak window height, width, placement and opacity.